Yes, the month has just started, we’re not quite halfway through the round, and I’m changing how I do things. This probably shouldn’t surprise anyone. I seem to have trouble sticking to one way of doing things. For now, I’m once again going to try to focus on one thing at a time. I organized all the ideas and drafts into sets. I have 5 in each set, 1 from each series that has gone out to at least my CP and a standalone(of course, we’ve seen before what usually happens with my standalone ideas-they turn into series). I’ll work through the next step of each of them before starting back at the beginning. Right now, most of them are in different stages. And for the first one, all but the standalone are already out to at least my CP, so that leaves only the one to work through. I still want to put some time between the first draft and revisions though. So, while it sits for a while, I’ll end up moving on to the next set(of which almost all are ready for revisions). As I get things back from CP and betas, I’ll work them in. With focusing on one thing, I should be able to get through things faster, too. I don’t know exactly how fast, though, so at the end of the month, I’ll be adjusting the schedule. I also started another short story on Friday. It’s more a bit of bonus content for Flames of Retribution. The tail end of it is in that from Mark’s POV, but I’m digging into just what led up to that from another character’s POV. I may end up not doing anything with it, but I’m just going to work on it on the side. I’m having fun with it anyway. I’m splitting my day into blocks of time. From when I get up until the kids are up(or 6 a.m.-which is usually the same thing), I’m working on this side project. Then, I start chores until they’re on the bus(around 7), then workout up to 8. From 8 to 11, I’ll focus on writing(or plotting or editing). Then, lunch and social media stuff and the rest of the chores until 1, when I’ll work on my crafting until dinner. After dinner, I can settle down with whatever I’m reading. The boy will be home Friday and the following Monday(those are make-up days for the girl because of their snow days), so this will be adjusted for that. We’ll see how long I can stick to this. The Choice: compile CP’s notes & work through Chapter 11 – Still waiting on this. Brann’s Story: Back stories – I have these and the rest of the plotting done. Also have the brainstorming for a standalone WiP done and have started on back stories. Read: Anything but Sweet(Candis Terry), All Good Deeds(Stacy Green), Come Monday(Mari Carr), Four Wishes(Christine Nolfi), & Unethical(Jennifer Blackwood) – I read through all of these. Enjoyed them all. Also read Riding Wild(Jaci Burton) and started Dark Paradise(Angie Sandro). 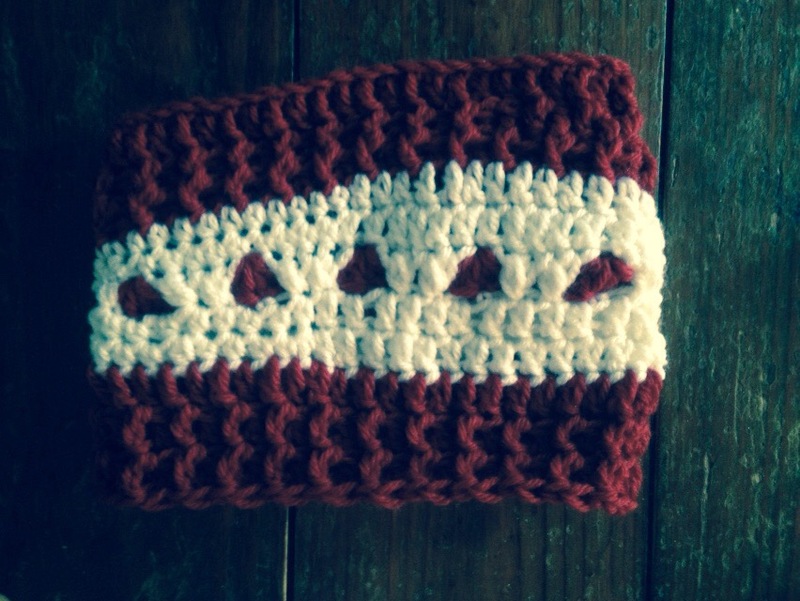 Crochet: Love is Cold Ear Warmer finished this on Thursday. It’s not usual for us to have a green Christmas around here. Usually we have at least a foot of snow to play in. And we did. Until Friday, when temperatures got up to the 40s and it rained all day. By Saturday, all our snow was melted except for what had been piled up by the plow. Today, even that is pretty much all gone. And it’s been in the 50s all weekend. Seriously, this is not normal for northwestern PA. It is supposed to drop back down into the 20s starting tomorrow and we’re supposed to get some snow. Not sure how much and if it will stick. So we might be looking at one of our rare green(or brown, considering it’s extremely muddy) Christmases. We stopped at the two dollar stores in town today and got the kids’ Christmas jammies(that Santa’s elves will sneak in while we’re out for Christmas Eve) and stocking stuffers. So, all Christmas shopping should be finished now. I don’t usually wrap the stocking stuffers, although I might because, since we keep things small, they’re usually done unwrapping everything in about 15 minutes and we don’t have to be down to my mom’s until later in the morning. And it’s doubtful the kids will sleep past 6 or so. So, we’ll have plenty of time. Finish edits on Slow Revenge: I finished these up on Thursday. Brainstorm on New Shiny Idea(that was sparked while watching Tangled yesterday even though it has nothing to do with Rapunzel) – did this. Think I have the basic plot ironed out, although it could change as I outline. I’ve been having fun with the research(Kansas in mid-late 1860s, cattle drives, etc.) and writing back stories. Have 2 done and 2 more to write. Read: Finish Slow Ride(ARC of Kat Morrisey’s book), Second Chance Romance(Asrai Devin), and Black Opal(Catie Rhodes) Like I said on Wednesday, I got in the mood to read more Christmas-related stories. I read Kait Nolan’s Be Careful, It’s My Heart(loved it! ), then I started Jaci Burton’s Kent Brothers trilogy, which are all set around Christmas. Finished the first 2(liked the second one better than the first) and am about 80% through #3. Then, I have Ripped(Sarah Morgan) and Once Upon a Snow Day(Kait Nolan) lined up to read. Knit: Lapghan – Finish Strip 3, have strip 4 almost finished – haven’t worked on this very much this week. Won’t have too many goals for next week, with Christmas and all. Probably baking cookies tomorrow with the kids. Tuesday we’re going to see my husband’s grandma then spending the day with his mom, and Wednesday we’ll be at my mom’s most of the day. So, anything I do get done will probably be Thursday and Friday, and the round ends on Thursday. Which, I will probably be waiting until then to post my round recap, even though I usually do that on Wednesday. I may or may not post something tomorrow. If not, I’ll be back on Thursday. I hope everyone has a Merry Christmas, whether it’s white or green. Almost forgot today was Wednesday. My daughter didn’t have school on Monday. And yesterday, her neck still didn’t seem much better so we took her back up to the doctor. Only to find out that she has strep throat! She wasn’t complaining about a sore throat, didn’t have a very high fever, didn’t have the rash she got last time, was still eating and drinking just fine. So none of the signs that she was sick. Except for the fact that her lymph glands were swollen. And they had been a little bit when we had her in before, but we attributed that to the fact that we thought she had a cold. Well, they were so swollen the PA decided to do a throat swab and it came back positive for strep. Otherwise we wouldn’t have known. So, she’s home from school again today. Send Slow Revenge to Beta Readers – no comment. Not sure why I’m finding it so hard to reach out and ask for readers for this. Brainstorm new ideas for western novella, Stained Snow – Still working on back stories. I finally finished the antagonist’s back story last night. It turned out a lot longer than I was expecting. I thought the protagonist’s was long at 7 pages. This one was 17 pages long. He had a lot to say. And most of it seemed to be how everything that happened to him wasn’t his fault, but usually his brother’s. I have at least one more to write and I’m really not expecting it to be nearly as long. Over the past week, I’ve written 15 pages. My goal was at least 10. So we’re good here. Start outlining Stained Snow – will get to this once back stories are finished. Read 20 books – I finished reading Katie Jenning’s A Life Earthbound last Wednesday and started the fourth in the series, Of Water and Madness later that day. And finished it on Thursday. I also read Dry Spell by Angela Wallace, Beyond the Waters of the World(novella) by Ruth Nestvold, A Dark Grave by J.A. Souders and Deadly Hearts by S.M. Reine. These last two were both short stories. Yesterday I started Unending Devotion by Jody Hedlund. I am about 20% through it right now. And I’ve been working my way through Writing With a Heavy Heart by Denise Jaden. Almost finished with it now. Workout for 30 minutes a day/5 days a week – I worked out on the Wii Wednesday and walked on the treadmill for at least 30 minutes Thursday, Friday, Monday, and Tuesday. Haven’t gotten my walk in yet, but hoping to do it if the kids take naps after lunch. Or at least when my son takes his. Track calories every weekday – didn’t do good with this at all last week but have been doing better the last couple days. At least with keeping track of everything. Staying within my calories not so well since I lowered them because I’ve just been standing still the last several weeks. I was maintaining, but I’d like to lose about 10-15 lbs. Feel like I haven’t really gotten much done in the last week. I know it’s not really true, but when I’m not in the middle of actually writing, I have a harder time keeping track of progress, so it’s harder for me to see just how much I’m getting done. Just have to remind myself that this is just as important a stage as the writing. Send Slow Revenge to Beta Readers – haven’t got anywhere on this. Need to put some more feelers out. Brainstorm new ideas for western novella, Stained Snow – have made good progress here. did some mind maps of ideas on Thursday and Friday. This week I’ve been working on character back stories. Still on the first one, but hoping to finish it soon. Start outlining Stained Snow – not quite to this point yet. Workout for 30 minutes 5 days a week – Have been able to manage this. Thursday: Walk on the treadmill, Friday: Cardio boxing on Wii & shoveled snow, Monday: Cardio boxing on Wii & shoveled snow, Tuesday: treadmill, & more cardio boxing today. I’ve been making steady progress so far this week. And I think I’ve pretty much decided that I won’t be doing Sunday check-ins, at least for right now. It seems either we’re doing something with family(this weekend is my nephew’s 2nd birthday party) or I’m just not on the computer. Usually on the weekends I’m concentrating more on my knitting or crochet, so I’m not even at the computer really. So, I think sticking with just the Wednesday updates will work better for me. Finish 1st round of edits on Slow Revenge – Like I said, steady progress here. I’m almost through Chapter 25 right now. Just have one more scene to go. Hoping to be through Chapter 27 by the end of today. Was hoping to have this finished by Friday, but I ran into a pretty big research/plot hole that I need to fix. Not sure of the best way to fix it, so I need to figure that out. So, I’m working through the other things while I think on that. Finish 1st draft of Flames of Redemption – Haven’t worked on this at all yet this week. Probably won’t until Slow Revenge is finished. Monday night I did do a little more outlining for the WiP I’ll be starting once I finished Flames of Redemption. Didn’t feel like sitting at the computer to work on edits after the kids were in bed, so instead sat on the couch with my notebook while I finished watching the Hatfields & McCoys(finally! since we recorded it back in May). It also gave me the urge to brainstorm some for a story idea I’ve had for a while but only ever wrote a couple pages for. I didn’t write any of those thoughts down of course. Read 20 books – still working my way through Beauty of Fear. So, no more to add to this. I’m about 63% through it right now though. workout for 30 minutes 5 days a week – not quite meeting this. Worked out with the Wii on Monday. And shoveled snow for 20 minutes today. Didn’t do anything yesterday though. Track calories every weekday – started out strong on Monday then the site I use was down. So I never put everything else in. Yesterday after lunch, I started snacking(my downfall) and just stopped trying to keep track. Doing good so far today. Haven’t really even snacked. Just chewed some gum when I got the urge to snack. It’s just past lunch time now though, so I’m hoping to keep at it the rest of the day.